Just how many animals where on Noah’s Ark according to 6-day creationists? That answer has varied considerably over the past century. With the completion of the Ark Encounter, the most visible attempt to show the feasibility of preserving all land animal diversity from a global flood, more people are being exposed to a modern answer to that age-old question. The group – Answers in Genesis – who constructed the Ark Encounter theme park have provided the lowest estimate to date: a max of 6700 total animals. To rationalize their small Ark population they have become increasingly vocal about how modern biological diversity – the abundance of species – is the result of rapid speciation of ancestral “kinds” following a severe biological bottleneck during Noah’s flood just 4350 years ago. We could call these ancestors of modern species progenitor kinds or proto-kinds but just what is a “kind” and just how are the boundaries of one kind versus another determined? How a “kind” is defined is directly related to how much speciation and the pace of that speciation that young earth creationists must postulate. If a kind were equivalent to a species then no speciation would be required but every species – both living and extinct – of air-breathing land animals would then require boarding rights on Noah’s Ark. If a kind were equivalent to the taxonomic category of an “order” of animals then Noah would only need a couple hundred animals on the ark. For example, only one pair representing all rodents, another pair for all carnivores and so forth. Given the Ark Encounters low estimate of animals on board it should be obvious that they have a very inclusive understanding of what a kind is. But has a kind always been this inclusive? Today I want to survey how the boundaries of what constitutes a biblical kind have changed by looking at the creationist’ literature over the last 40 years. It wasn’t until the 1990s that the YEC literature began to regularly talk about their views of massive post-flood speciation. Seeds of this rapid-speciation model have existed since at least the 1940s and in the future I hope illustrate this through some writings from that time. However, direct references to post-flood speciation and discussion of the meaning of “kinds” and how they may have speciated after the Flood are virtually non-existent even if speciation within kinds might have been accepted by the YEC leaders. Following the publication of The Genesis Flood by Drs. Morris and Whitcomb in 1961 more questions were raised about the carrying capacity of the Noah’s Ark but little was written about species and their origins. From my creationist’ book collection I picked out 10 books written in the 1970s and early 1980s whose primary topic was evolutionary theory or at least included sections about evolution. 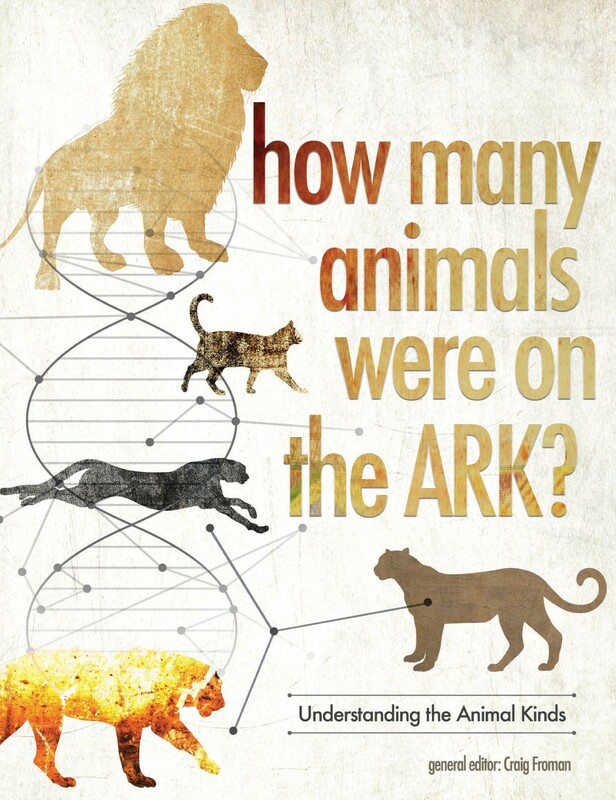 I tried to determine what the authors views were about how many species were on the Ark, how many species may have formed since Noah’s flood and their opinion of natural selection. Unfortunately, all of the authors except one focused solely on the origin of groups like birds, amphibians or dinosaurs and none talked about species within families. A seminal YEC book, more than a decade later, sought to define the capacity of Noah’s Ark and how the animals could have been preserved. That book by John Woodmorappe was titled: Noah Ark: A feasibility study (1996). In it, Woodmorappe suggested that a biblical kind could be roughly equivalent to a genus: “In most cases, those species descended from a particular original kind would be grouped today within what modern taxonomists (biologists who classify living things) call a genus (plural genera).” As a result he predicted that Noah would only need to have had representatives of 8000 kinds of animals on the ark or about 16,000 individual animals. In 1997, a YEC writer and speaker, using Woodmorappes as his reference, asks the 10,000 dollar question: “How did all the Animals Fit on Noah’s Ark?” (Creation 19(2):16–19 March 1997) Sarfati’s answer was similar to that presented at the Ark Encounter in Kentucky: Today’s species are the products of speciation from a much smaller number of original common ancestors preserved on the ark. A book for sale at the Ark Encounter gift shop. You can see on the cover that the felines all came from a single common ancestor cat on the Ark. So just how many separate kinds did God create? Young earth creationists have gone from talking about tens of thousands to 8000 (Woodmorappe, 1996) to a max of 1400 (Ark Encounter) with strong hints that it may well be fewer than 1000. Where will this slippery slope end? 500, 250, possibly only 100 kinds? Apparently God’s original creation contained very little initial species diversity. Will the striking similarities of the genomes and many other physical traits of whales and hippos cause creationists to one-day suggest that whales are simply ungulates that God provided with “directed mutations” to help them adapt to an aquatic habitat and thus place them in the ungulate group as taxonomists have – a single ungulate kind? Will the lack of any fossil record in flood-rocks of any modern-day mammal groups lead creationists to suggest that few mammals existed prior to the Flood and that most mammal species are the result of post-flood evolution? Are manatees simply aquatic elephants and shared a common ancestor on the ark? Will all carnivores be considered one kind with cats, dogs, weasels, bears and seals all related by a single common ancestor? By what criteria can they say this is not possible? Lack of hybridization (see below for more on criteria)? This might sound fanciful but if you were to take an anti-evolutionists of the 1970s to the Ark today they might be very shocked to see the vast amount of evolution on display there. Even today, most Christians who were brought up on YEC literature have the perception that special features of animals were created directly by God not by any natural processes over time. In a talk at the Creation Museum last month, Ken Ham reiterated this same claim saying “and we believe that all bats are probably the same kind.” That the Ark Encounter team can speculate that “it is quite possible that every bat is a member of the same kind” is a mind-blowing statement. How could the incredible array of diverse characters that are found among the bats be contained in just a few ancestors just 4000 years ago? Bats are so diverse that scientists classify them as an order with suborders and then families within those suborder. Genetically and morphologically bats are at least as diverse as the orders of rodents, carnivores and ungulates. Each of these orders of mammals contain many families which the Ark Encounter believes are separate kinds. To suggest all bats are derived from a common ancestor would require phenomenal amounts of new diversity which could only be generated naturally by mutations. So far this is something that no creationist is willing to consider because that sounds like the creation of new information and mutations are considered degenerative by YECs. If they admit that mutations can create new features they might as well pack up their anti-evolutionary pamphlets and join the evolution crowd. But seriously, if Ken Ham is willing to speculate that all 1240 living bat species and countless extinct species would have been derived from just a single set of common ancestors on the ark what is to stop him there? Why not propose that the ancestor of bats might not have been able to fly? Couldn’t God have anticipated the new niches that would open up after the Flood and programmed the genetic diversity required for making arms able to take flight into a non-flying common ancestor which was stored on the ark? Why not? This might sound absurd but the very idea that 1240 species of bats could evolve from a common ancestor in just a few hundred years is completely absurd already. You might respond, doesn’t the Bible mentions bats? Yes, but it also mention foxes and dogs which also didn’t exist as species until after the flood according to YEC hyper-evolution. So the bats mentioned in the Bible could simply have been the post-fall adapted winged mammals. The non-scientist might respond, but a bat is a bat right? That sounds reasonable, but please consider that this is equivalent to saying a carnivore is a carnivore, a primate is a primate, or a rodent is a rodent. The carnivores such as cats, weasels, wolves and hyenas aren’t that different from one another so why not include them all as members of the same kind? If bats are the same kind then surely cats and dogs can be too, right? This may sound ridiculous to the anti-evolutionist but that is the point. If you look at the common ancestors of the families of carnivores or the common ancestors of the families of bats they are not all that different from one another. You could say the ancestors look no different than members of a family do today and so they themselves are members of the same family. So bats all have a common ancestor and carnivores do too. If YECs want to find evidence that all carnivores evolved from a common ancestor they need look no further than their own literature. Dr. Jeanson has already provided the evidence in a paper (Mitochondrial DNA clocks imply linear speciation rates within “kinds”) and a wonderful illustration which I show below. Figure 12 from Dr. Jeanson’s article Mitochondrial DNA Clocks Imply Linear Speciation Rates Within “Kinds”. The colors represent families with lines as species. The circles are the presumed common ancestors of the kinds that were on Noah’s Ark. In the above illustration Dr. Jeanson has compared complete mitochondrial DNA genome sequences of many species of carnivores. 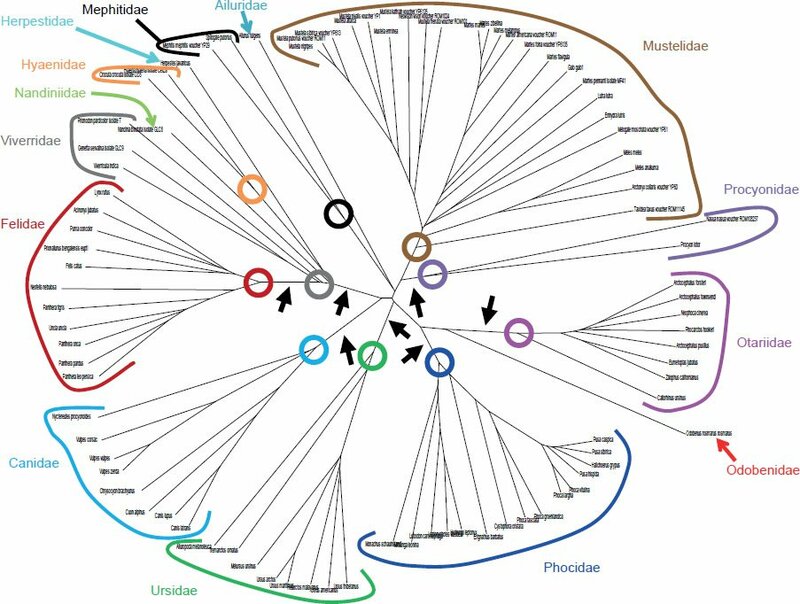 The resulting phylogenetic tree depicts an evolutionary scenario for how all these species are related to one another. The circles indicate the common ancestor mtDNA genome for all the members of the kind which are in different colors. The center of the tree shows a point where all lines converge. That convergence point would represent the common ancestor of all the carnivores. But Jeanson doesn’t accept that such a common ancestor exists. He believes that God made animals at the circles and thus those ancestors/circles have no connection at the center. Just look at the tree again though. If you were to go back in time and witness the animals departing the Ark, according to Jeanson you would see the animals represented by the circles. But how how different would they be? Those genomes would be no more different from one another than the species of one kind are today. In fact, it very well could be that he species within one kinds are more different than those different kinds were at that time. Jeanson admits this in his figure legend: “As the black arrows highlighted, the DNA differences separating the roots of different families were short relative to the DNA differences separating the species within a family.” So why stop at the circles. Why not say that God made a single carnivore kind which then became 12 or 13 different sub-kinds of carnivores? David MacMillan has already explored this carnivore problem quite thoroughly (Dodging Darwin: How Ken Ham’s Ark Encounter is Slowly Embracing Evolution). You can keep pushing common ancestry back but how far? Young earth creationists insist there are limits but their changing goalposts for what constitutes inclusion in a kind suggest that they don’t have a firm idea of where the limits of common ancestry are. Creationists think finding common ancestors of kinds is a slippery slope leading to a common ancestor of all living things and they are partly right. But they have found themselves on that slope and are having trouble finding a place to land. For example, in A Symposium on Creation Vol III, edited by Donald Patten (1971) there is an article by Frank Cousins entitled “Alleged Evolution of the Horse.” Cousins says that horses alive today are horses implying that they are one “kind” though he never uses that term. It seems he believes horses are one kind but he never mentions donkeys, asses or zebras so I can’t be sure how broadly he defines the term “horse.” One thing for certain is that he believes that fossil horses are not horses but rather wholly separate species that are not evolutionary ancestors to modern horses. This is a perfect illustration of just what I am saying about the term kind become more and more inclusive over time. The Ark Encounter includes a recreated horse ancestor that is one of the multi-toed fossil species that Cousins in 1971 insisted couldn’t be related to horses because that would be accepting that evolution has happened. One of the most used criteria for defining the limits of a kind has been the ability of members of a kind to interbreed. While that is frequently used to include members in a kind, the fact is that vast majority of species that are placed in a kind are unable to successfully reproduce or if they can they don’t produce offspring that are fit for their environment. Interbreeding in nature is certainly the exception among species rather than the rule. Furthermore, most species of any kind that have ever existed are extinct and so the ability to interbreed is untestable. YECs may respond that in many cases mutations have caused changes – carefully qualified as losses of information only – in descendants from common ancestors that do result in two species losing the ability to have genetic interchange. But if mutations separate members of a kind over time, it should be apparent that it will be very difficult to use hybridization alone to define the limits of a kind. Once two species that can’t hybridize are still placed in the same kind (ie. they share a common ancestor) what then stops anyone from speculating that any two species are part of the same kind? Are red pandas really just raccoons that can no longer hybridize with other members of the raccoon family (kind)? Maybe after departing the ark individual that eventually became red pandas could originally hybridize with populations that eventually became raccoons and skunks but because they got separated they had mutations that eventually caused them to lose genetic continuity with their previous family members? How do we know that this didn’t happen when no one there to witness the time when they could hybridize? Do you see how the boundaries between kinds quickly becomes very arbitrary? This is one of the reasons that the kind has grown more and more inclusive over time. Cover image: A YEC view of the origin of carnivores. Image created by David MacMillan and published here. Thank you for doing this kind of research! I find it both shocking and reassuring at the same time. It is shocking . . . because, as a young-earth creationist, I was taught never to imagine anything like this. On the other hand, as a young-earth creationist, this really opens up the opportunity for theistic evolution (a la Perry Marshall) . . . which suddenly makes mainline science very reasonable . . . which is rather reassuring. From the other side, as a theistic evolutionist, young-earth creationists–even the most rabid–suddenly begin to sound like maybe they are beginning to come around to a more reasonable scientific perspective. Shocking, yes?! Not a problem for OEC such as I. As I deny the global interpretation of the flood account and accept billions of years prior to Adam in which species were created and went extinct many times over, I am free to view the biblical “kind” akin to how the historical hebrews actually viewed it, as roughly correlating to what we call a species or in some cases, genus. Though I would never push it up to family. Their interpretation of the statement “bring forth after their kinds” is foreign to text. “Min” is never used to mean a category of animal, this statement to anyone not looking through a YEC “lense” would clearly be a reference to these created species producing offspring to continue after death. As in, setting the table for future generations. It is not a statement of God going “Okay, I created a bunch of bird kinds, now let me define “kind” for you”. If you read Genesis 1 looking for ‘kinds’ (of land creatures) then there are kinds (most people would think species rather than families?) of birds, of livestock, of creatures ‘that move along the ground’, and of wild animals. That AiG say there were only 6,700 (I assume that’s 6,700 pairs; but later you say 1,400 – in bold type – and I see that that figure has appeared in the US press and also on the AiG website though only as a footnote) in total suggests that they are making up a fanciful story based mainly on the Bible – one that has an agenda of ‘refuting’ so-called molecules to Man with ‘biblical creationism’ and ‘real infallible history’ recorded in Genesis. The YEC view is extremely inconsistent with the bible. The word for “livestock” is “behema” which corresponds (roughly) to our modern category “ruminant”. Most scholars would agree with this. It essentially refers to hooved animals. Yet “min” or “kind” is used plurally. It follows logically that there are more than one “kind” of ruminant. Incidentally, some YEC have said the same of rodents. Which would also be inconsistent with the text as the word “remes” or “creeping thing” corresponds to “rodent”. Also indicating that God created multiple animals under the banner “remes”. actually, the Hebrew word used for “creeping things” has a wide variety of meanings and usages in the Old Testament. It can refer to certain land animals or even to insects. To limit it’s usage primarily to “rodent” is being more restrictive than the Hebrew language allows. Not saying it couldn’t include rodent, but actually applies to a very general category. I would also be careful reading too much into singular and plural renderings. While sometimes pregnant with meaning, other times it is a simple reflection of the singular or plural nature of the predicate, such as kinds with livestock and wild animals (both plural) or with every “thing” (singular) translated as it’s KIND. Word studies are fraught with these kind of snares. Context is often the best barometer of meaning. Anyone, whether aig, yec, oec, etc. has to be careful about reading into a passage meanings that the passage has no interest in conveying. I’m not against developing the possible meaning of a passage where necessary, especially when there is a dearth of specific information. Just saying caution is always in order. hippos related to whales. what an absurd idea. I doubt any scientist has actually believed such a thing. I sure would want verification of such a thing before I could believe it. But that’s just me. I can’t tell if you are being sarcastic or not. More accurately, hippos are the closest living relative to whales. That doesn’t mean they are the ancestor of whales. Whales are ungulates and fall well within the ungulate group whether you look at their morphology or genomes. Similar to saying that seals are carnivores and their closest living relatives are bears. Hi Joel, YECs certainly do consider similarity as a criteria for designating kinds, so evolutionists’ assessment of the similarity of whale and hippo morphology and genetics is very relevant to us; but I would say that dissimilarity is a stronger factor which we use to define the boundaries between kinds. In other words, even a large amount of evidence of similarity can be undone by a smaller amount of evidence of discontinuity. So in response to your question of whether or not we’ll eventually include hippos and whales in the same kind due to their striking similarity, I would say no because morphological features like tail flukes and dorsal fins and perhaps as many as 10,000 novel genes distinguish those two species. Thoughts? First off, doubting that whales have 10,000 novel and distinguishing genes, considering that they only have about 20,000 genes (similar to human, pigs, etc.) I don’t think the hippo genome is done yet, however, I would bet that whale/hippo genomes are pretty similar given the known close similarity of the available genes. Second, are the dorsal fin/fluke really such concrete barriers? What are they beyond a prolonged signal to build cartilage in one spot during development? This doesn’t even really need new genes, just a different expression pattern of existing ones. Hi Claire, I think you’re right that the hippo genome is not yet complete, but this paper (http://rsos.royalsocietypublishing.org/content/2/9/150156) characterized the hippo transcriptome and compared it to the genomes and transcriptomes of a number of cetaceans. They found 20-55% more putative orthologues between whales and dolphins than they did between hippos and dolphins. In other words, hippos appear to be missing as many as half of the genes that whales and dolphins share. There’s some variability to be expected since they were comparing transcribed genes which may not represent the entire coding genome. Nonetheless, they used RNA from a number of tissues from the hippo making it a more representative picture. As to the dorsal fin and tail flukes, to my knowledge we don’t know which genes regulate the development of those features. I personally don’t expect that a few modified genes would account for such dramatic alterations. Those features are not like a Giraffe neck, for example, which is simply an elongated version of an okapi-like ancestor’s neck. One could easily imagine (and published results suggest) that a few genetic modifications of existing genes increased the size of the somites which then gave rise to longer necks. But in the whale you’re talking about gaining a new, functional anatomical feature. I understand your “prolonged signal” suggestion but I personally find it unlikely to explain the rise of such unique features, especially when dramatic genomic differences suggest otherwise. You’ve got a wrong interpretation of the paper’s ortholog counts however. Particularly, “They found 20-55% more putative orthologues between whales and dolphins than they did between hippos and dolphins. In other words, hippos appear to be missing as many as half of the genes that whales and dolphins share.” isn’t right. The authors aren’t trying to rigorously define gene contents of these species, rather, they trying to assemble a set of very good gene alignments to search for positively selected genes. Consider that, if the ortholog counts could possibly be interpreted as showing that hippos had half the genes of whales/dolphins, this would absolutely be the main message of the paper, as this would be an amazing and unexpected finding. The fact is, mammals have about 20,000 genes. Whales have about this many too, and there’s no reason to expect that hippos would differ substantially from the norm. | As to the dorsal fin and tail flukes, to my knowledge we don’t know which genes regulate the development of those features. We do however have detailed knowledge the series of signals that leads to the accumulation of chondrocytes which create cartilage matrix. This pathway is found across animals in approximately the same form, creating structural cartilage in variety of body parts, so it’s unlikely that whales have whole alternate pathways to build specifically dorsal fins. http://www.nature.com/nature/journal/v533/n7601/abs/nature17398.html . What I want to say is, just because something looks different morphologically, doesn’t mean the underlying genetics of the thing are very different. One of the reasons why comparative biology as a field is so laser focused on finding differences between species is that the similarities are much easier to find. Like in the whale paper, where they find a few protein changes among the whippomorphs, not drastic things. So you know my thoughts on whale evolution, what is your model of where whales came from? One original wholphin? Hey Claire, I tried to “like” your comment, but it asked me to log in so I gave up. Your critique is valid. I fully recognize that orthologue identification was not the point of the paper. However, on some level that’s just the authors being careful to not get ahead of the evidence. Its still reasonable to look at their analysis and wonder why they found so many more alignments between whales and dolphins than between hippos and dolphins if their genomes really are so similar. That’s not a wrong conclusion; its just preliminary. I’m sure 10,000 is probably an over-estimate on my part, but it still appears that a great deal of genetic novelty could be expected between those two species. I think this statement is a non-sequitur. Specifically, it doesn’t necessarily follow that because there is a similar mechanism across animals for chondrocyte accumulation that any novel structure using that system can be produced without other information or pathways. I maintain that we need to understand how those structures are regulated at the genetic level before we drawn any conclusions, especially since those structures are morphologically diverse among species, which suggests that they’re heritable and not the result of random accumulation of chondrocytes; in other words there’s a genetic mechanism directing their shape, location, etc. If it was simply a random accumulation then there would be no similarity of structure among whales progeny, and thus no ability of the species to rely on that structure. As an illustration, consider that understanding the curing process of concrete doesn’t tell us anything about how its assembled into a parking garage. There’s a separate set of plans required. Bad analogy? I’m happy to know your thoughts on whale evolution. I don’t have much of a model. I’m a YEC, so I believe that God created an aquatic mammal “kind” which diversified into the extant kind containing whales, dolphins, porpoises; perhaps all cetaceans. There’s a lot more basic genetics that need to be done to define the differences between these species, though. Once we have those data, YECs will hopefully do the baraminological work necessary to define kind more definitively. Eh, still, the higher number of whale/dolphin alignments probably has more to do with their BLAST cutoff score than gene contents. Closely related species return more hits than more distantly related species, whale–dolphin——hippo. Too bad the supp data seems to have disappeared into the void. Following through with parking garages, I’d distill my idea to: An (inherited) set of instructions to build a parking garage is very useful for building another parking garage in a different location. Now you’ve got me down a hole reading about how baraminology is done. I’ll be keeping an eye out for future papers on the subject. It does strike me as taking an ax to a tree to prove that its made out of branches. Hmm, also thinking that I should try out this cogitum approach next time I have to figure out clustering cutoffs for groups. you are correct in stating that many now believe that hippos are closely (closest) related to whales. I am being sarcastic, of course, as per your previous thread and my debate or whatever it was with Christine. You would be incorrect to make that statement as if it is ALL that has been believed about the proposed link between hippos and whales. Some scientists to this day have not bought into the “whippo” hypothesis in any manner, some have, and some, most of those from when it first came on the scene (end of 20th cent), believed that there was an ancestor/descendant relationship between the two. As to what percentage of scientists believed any of those options, I do not have that data. But all three have been (or are) adhered to. Documentation can be found on previous thread that you closed a couple of weeks ago. You’ll have to forgive me for posting it for a third time. Anyway, great to see some chatter about science. What? The earth 6000 years old. What an absurd idea.I doubt any scientist has actually believed such an idea.I would sure want verification of such an idea before I could believe it. But thats just me. jon I’ve warned you about jumping halfway through a thread argument.My post was sarcastic in nature, honed to prove a point. Without understanding totally and correctly the topic matter, any attempts at hijacking for personally usage will more than likely sabotage whatever usage you intend for it. you’ll have to forgive my tongue in cheek comment, Ashley. I couldn’t help but see the irony in your reference to the “whippo” hypothesis. You have to understand that after arguing with another who posts on these threads for a couple of weeks and giving proof after proof that such a hypothesis was (and still may be) believed by scientists only to be met with obstinate denials by said blogger (while others “sat” by idly and silently), then, a week or so later to hit another thread and find the same hypothesis casually brought up as if it is common knowledge. One can’t help but see the shallowness of the argument that scientists (and those who do science) hold each other accountable, and that science is a self-correcting (by scientists) method of studying our world and this universe. Forgive me if I harbor serious doubts that this claim is actually always true. Don’t get me wrong. This isn’t sour grapes. I truly find it humorous, but not surprising. I knew all along that I was correct. As were others who have written about it long before me. Having followed the hypothesis from it’s birth and the following studies and disagreements by other scientists and researchers, I certainly didn’t need someone to agree that it was true. That was already historical fact. It just became an object lesson about some who cannot bring themselves to admit they are or were wrong, or that science doesn’t always get it right. It wasn’t an attack on science as much as it was a lesson on human nature and it’s fallibilities. Genetic homology, morphology, nested hierarchies an d other lines of evidence support whale hippo common ancestry. If you spotted a missing word just now, the missing word was indeed ‘evolution’. Hi, thank you good article. I’m a young earth creationist but I don’t believe that every land animal outside the ark died. Do you have any references from John Ray, John Arbuthnot and Edward Lhwyd on the creation of fossils? Hi Ryan, thanks for the comment. On my Best of NH page down near the bottom are links to a few posts which include quote from both Ray and Lhwd about fossils. There is book titled: English Naturalists from Neckam to Ray that talks about various natural theologians and their thoughts on “formed stones.” I also have a book with John Ray’s letters. It is in his letter – though not many of them – that talks about fossils more so than any of his books. I’ve always meant to pull out more quotes and put them on the blog. I find it helpful to see how people thought at the time because they would not have had their thoughts clouded by the creation/evolution debate as we do now in conversation. The book on English naturalists sounds awesome. (2) If I follow AIG logic, 2 of every “kind” of land creature was taken onto the ark. And they say essentially all fossils of land creatures we find are as a result of the Flood. But isn’t this completely contradictory? If the millions of all sorts of specific species that are in the fossil record were destroyed by the Flood, why weren’t these same specific species taken onto the ark? In other words, per AIG logic, shouldn’t nearly the entire fossil record consist of land critters similar to the “kinds” AIG is positing that they show in the Ark Encounter?